Dump cake traditionally features few ingredients and requires little cooking know-how, making it a great choice for beginning chefs. 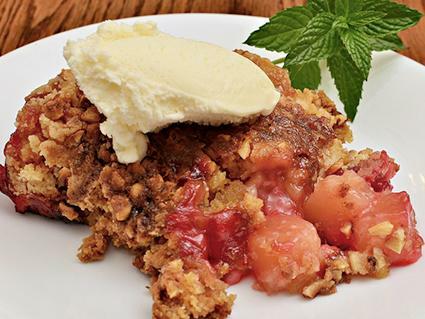 The next time you need a quick, tasty dessert, consider one of these favorite dump cake recipes. Consider serving this dump cake alongside a scoop of chocolate ice cream for a flavorful dessert! The addition of pineapple gives it a tropical twist. 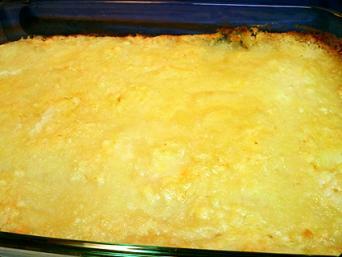 Grease bottom and sides of a 9 x 13-inch baking pan. Pour pineapple into the bottom of the greased pan. Make sure the fruit and juice are spread evenly throughout. Spread cherry pie filling on top of pineapple. Sprinkle cake mix over the top of cherry filling, making sure it is evenly distributed and covers all fruit filling. Pour melted butter over cake mixture. Be sure to get as close to the edges of the cake pan as possible, covering as much of the dry cake mix as you can. Bake for 55 to 60 minutes, or until top is golden brown. Allow to cool on a baking rack for 10 to 15 minutes before serving. Cut into 24 even pieces. The light, refreshing taste of lemon in this dump cake makes it a perfect choice for spring celebrations. Grease bottom and sides of a 9 x 9-inch cake pan. Pour lemon pie filling into the bottom of cake pan. Use a butter knife or off-set spatula to spread filling evenly. Sprinkle half of the cake mix over top of the lemon pie filling. Carefully place cream cheese cubes over cake mix, spacing them out evenly. Sprinkle remaining half of cake mix over the top of the cream cheese cubes. Top the cake mix with butter slices, being sure to space them out evenly over entire cake surface. Bake the cake for 35 to 40 minutes, or until the top is golden brown. Allow the cake to cool on a baking rack for 10 to 15 minutes before serving. Slice into 16 even pieces, and serve with vanilla ice cream, if desired. 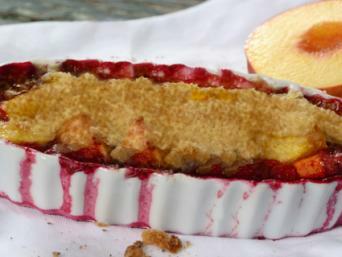 Though this peach melba-inspired dump cake features frozen raspberries, you can also use fresh berries when they are in season! Pour peach pie filling into the bottom of the greased pan. Make sure filling is distributed as evenly as possible. Place raspberries over the top of peach filling, spacing them evenly. Sprinkle cake mix over the top of berries. Get mix as close to the edges of the pan as you can. Place butter slices over the top of cake mix. Bake for 45 to 50 minutes, or until top of cake is golden brown. Cake is a perfect ending to any meal. Fortunately, dump cakes are a cinch to make -- so you won't have to slave all day in the kitchen for a sweet treat! What's more, they are often made with simple ingredients that are common pantry staples. Make one tonight and hear your family beg for seconds!